After a quarter-century's service, the fairy godmother to such luminaries as Cinderella and Sleeping Beauty has resigned her position; "I'm doing more harm than good now. It's time to move on." Historically private, Fairy Godmother agreed to an interview under the condition it take place at her local pub; "I started out in this business wanting to do good -- to protect my girls from impending doom. Once done, I thought they'd see escaping their respective predicaments as an opportunity for betterment, eventually enriching the community by paying it forward." She sighed, "This is not what came to pass. I created an environment of entitlement. In the long run they would have been better off solving their own problems." After a few hours and a few gin martinis, she was more forthcoming and less politic regarding her feelings; "Having a fairy godmother is a privilege. A privilege! Those princesses didn't appreciate me! They didn't appreciate the leg-up my powers and personal connections gave them! Once they got their princes they became lazy -- lazy, lazy, lazy. They traded ambition for low-grade, yet constant whining. The castles, the gowns, the jewels -- never enough." "And when I quit," she continued. 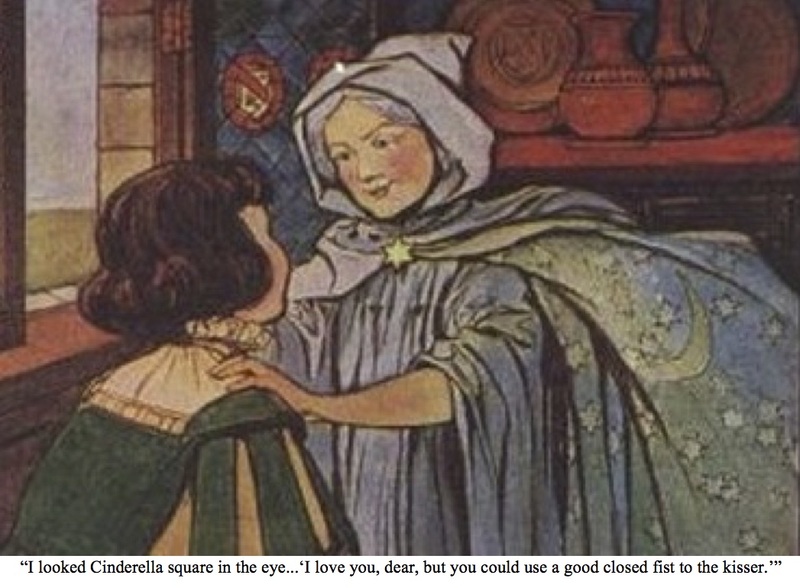 "I looked Cinderella square in the eye and said. 'I love you, dear, but you could use a good closed fist to the kisser.'" Image: Illustration from The Little Lame Prince and His Travelling Cloak by Dinah Maria Mulock, illustrated by Hope Dunlap 1909. Public domain via Wikimedia Commons.